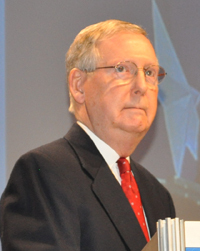 Sen Mitch McConnell - No Republican Fingerprints on the ObamaCare Bill. Liberals are on the run. "Oberman is out and Reagan is in!" LIberala are all out praising Reagan because they want you to forget what they have been up to. Democrats continue to underestimate the intelligence of the American Voter. We will not let the people who tried to turn this country into France walk away from their record. Healthcare bill is reaking havoc on our economy. We must push until the Court overturns it or the President repeals it. 2009 Newsweek said "We are all socialists now". Be proud of your principles. Be bold in seeking new candidates and never fallback on your principles. From speech two years ago. We have now embarked on our comeback. If our conservative prinicples are right then they are right for all people at all times, no exceptions. It is because of our principles that we now have Speaker Boehner and not Speaker Pelosi. This is why we are talking about how much to cut, not how much to spend. How can free enterprise grow the economy, not how can government create jobs. We do this, not because it is popular, but because it is right. We stand for limited government and not free enterprise. WE STAND FOR AMERICAN EXCEPTIONALISM! We insit that the Constitution means what it says. With no apologies. Talking about great Conservatives of the past. We must continue to fight Obamacare. We didn't take an oath to defend what is popular. We took an oath to defend the Constitution. No one has the right to tell anyone they must buy something. Send ObamaCare the way of HillaryCare. Dems want to put this behind them. They know this bill is a disaster, that why they are giving a waiver to their union buddies. Let's take up the repeal vote again and gvie everyone a waiver. Then we can create true healthcare reform that keeps the government out of your doctor's office. We are here to advance the Conservative cause not to be popular. Praised Sen. Minority Whip Kyle who announced he will not be running for re-election. We must engage in the fight against spending and debt. Paul Ryan is leading the cause in the House. Sessions and Paul leading fight in the Senate. The debate has been shifted from spending and debt to Constitutional Responsibility. When the people realized the Democrats were coming after their healthcare, they decided that was enough and rose up. Stay engaged and keep fighting! Be proud of our principles. Be daring in recruiting new candidates and never waiver from your principles!